Last summer, I wrote two posts (here and here) on how to build a garden box for a deck, based on the one created by my sister and her husband. They hosted a barbecue on the 4th of July this year, and I got a chance to see how the deck garden is doing in its second year. The answer: great! They planted different tomatoes this year, opting for slicers rather than cherries, and have plenty of green ones on the two plants growing in the box. They also have several beautiful looking basil plants, as well as oregano, parsley, rosemary, and chives. All of this is just outside the door to the kitchen, making it convenient to snip a few herbs for cooking projects. The deck box, which is made of cedar, remains attractive, despite heavy rains this year and its sunny location. An easy project with tasty results! I love a little patio garden! Especially when it has tomatoes! It may sound slightly ironic to get your garden ready for the early spring during the winter months, however, by choosing this method, it takes all the pressure off you to get the garden ready in record time. Hey Quick question. Did they have to change the soil a year later ? or the old soil worked fine ? You do not need to change the soil every year. Just add a bit of compost or fertilizer. After a few years, you may want to change out part of the soil each year. What do you use for compost and do you make your own compost/fertilizer? So glad I found your blog! Natalie — Thanks for stopping by. I do make my own compost but I also supplement with bagged compost or manure. Our city also has a compost pile, which is free, and I will occasionally pick up compost there. Hi Mary! Thanks for your reply. How nice that your city has a compost pile. I live in Kampala, Uganda and I haven’t yet seen bagged compost or manure easily available in the city, hence me wanting to make my own. 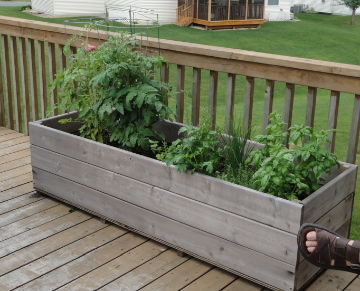 I think we’re going to try a compost bin on the deck as we use so much fresh stuff and it would also be a great way to recycle it. I left a comment on one of your other posts asking how much water you give each garden box? I am using 5l for 3 boxes similar to what you have. I am so scared of over watering.